Oh no! The Census is out, and Northern Ontario is losing population! Heads are scratched and teeth are gnashed. Hands are held out – demanding more money from senior levels of government so that we can do something, anything. We’ve got to figure out a way to grow Grow GROW – or we risk turning Northern Ontario into one giant ghost town! Ok, let’s step back for a moment. What do those numbers really tell us? The Census shows Ontario’s north has seen an overall loss of population between 2011 and 2016 – down 2,600 people to 548,449 in total. The decline isn’t evenly spread out. Some areas, like Greater Sudbury and a few surrounding municipalities, have seen modest growth, while others like North Bay and Sault Ste. Marie experienced slight population loss. The Census story is really more about population stagnation, rather than any significant decline (First release 2016 Census data is available here: “2016 Census topic: Population and dwelling counts,” Statistics Canada, February 8, 2017). The data isn’t making any values judgement. The numbers can’t tell us what’s good and what’s bad. And yet, time and again, our elected leaders, our media – and, I suspect, almost every one of us, view growth as both good and necessary for the health of our communities. We have so completely accepted the pro-growth paradigm that we rarely pause to assess whether it’s true. We’ve been told that we need to grow our cities in order to grow our economy. With more money in our pockets and in municipal coffers, we can do more things, buy more stuff, fix more roads. Every new house on a formerly vacant piece of land means more property taxes collected by the municipality. And the occupants of that new home are likely to be employed, maybe even at a new job, adding their own wealth to our local economy. But what if it’s not true? What if growth isn’t always a net boon to our community? That new house on formerly vacant land was likely to have been built on the fringe of an urban area. Do the new taxes being paid cover the costs of extending services – roads, sewer and water pipes, school busing, maybe even transit? Is this kind of growth sustainable over the long term? We often hear that growth pays for itself. That’s a myth. All growth comes with costs as well as benefits. Denser development in areas where services already exist – especially where those services are being used at levels well below their capacity – has proven to be less expensive to service than low density development on urban fringes. We know this – and yet the Census shows that throughout Canada, we are ignoring this lesson (see: “Big Canadian cities see faster suburban growth despite bid to boost density,” the Globe and Mail, February 8, 2017). Census data shows that Greater Sudbury experienced modest growth, adding 1,271 people since 2011. But growth didn’t occur uniformly throughout the City. Generally, inner city census tracts declined in population, while most of the growth occurred in Valley East, Valley West and Walden. Outside of the City, Markstay-Warren increased its population by about 10%. Plans to develop new greenfields in Greater Sudbury are underway. Later this year, Council will be debating whether to build a new community arena and events centre on unused land on the former City of Sudbury’s urban edge. And last year, the City committed to spending just under $100 million to build the Maley Drive extension, a new four-lane parkway along the former City of Sudbury’s northern urban fringe, in part to open up new areas of the City to development. Meanwhile, the several dozen revitalization projects called for in the 2012 Downtown Master Plan are collecting dust after being shelved. Transit ridership remains flat-lined since 2005, because people are moving out of the transit-supportive part of the City. And, quite perversely, the City continues to offer those living in outlying communities a break on their property taxes, thanks to an area rating scheme that didn’t make any sense even at the time of amalgamation when it was imposed back in 2001. We clearly have a conundrum. 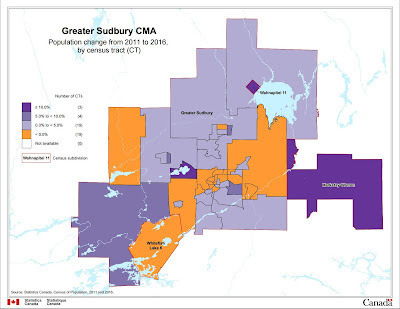 The places in our communities which cost the least to service – existing urban areas – are the places which are losing population, while more expensive to service outlying areas are growing (see 2015 Ward 1 municipal election candidate Matt Alexander's excellent analysis: “Census Reveals Flaw in Greater Sudbury Transportation Master Plan,” Matthew Alexander @WestEndMatt, Storify.com, February 8, 2017). And it’s happening not just in Northern Ontario, but throughout Canada. In metro Calgary, Edmonton, Vancouver and Toronto, some of the fastest-growing census tracts are located in the suburbs and the exurbs. While some existing urban areas (like Toronto’s Liberty Village) have seen spikes in population growth, many other inner-city areas have seen declines. In Northern Ontario, where growth is stagnant, providing incentives for expensive development in preference to creating strong, viable transit-supportive communities is completely cuckoo – especially when we know that the costs of transportation, home heating and electricity are all going to rise. Large homes, located far away from jobs in car dependent communities, are the antithesis of a fiscally sustainable development form. That way lies financial ruin. Cities are confronting rising costs. 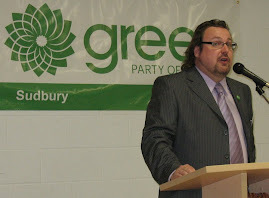 Many, like Greater Sudbury, are facing the need to renew fixed infrastructure, likes roads, bridges and pipes. No one wants to see taxes go up. And yet we continue to dig ourselves into an ever-growing, increasingly costly hole by ignoring our urban areas, and concentrating new development on the fringes. The Census can’t tell you that this kind of growth is unsustainable. But it is. An edited version of this post appeared in the Sudbury Star, as "Sudbury column: Not all growth is good," online and in print, February 11, 2017.